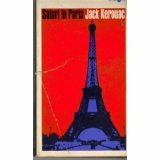 Satori in Paris reads like a poem in certain spots, before Kerouac reverts back to his beat-influenced narrative style. Jack is looking for the history of his family name, especially in Brittany, and he wants to meet his relatives or seek information about his ancestors. Will he find what he's looking for? Will he be accepted or ignored by those of his familial village. . .? Between encounters with Parisians, including ladies of the bars and eloquent cab drivers, Jack finds France a learning experience. Satori in Paris can be read quickly, and it sheds some insight on Jack's melancholy. He was forever seeking, trying to understand, trying to make sense of life. I read Satori in Paris again for this review, and it still held my attention as I tried to imagine Paris in the nineteen-sixties when it was written. Black and white images and rain. . .a figure walks alone. Satori means 'a sudden illumination' or 'a kick in the eye'. Satori in Paris is preceded by Desolation Angels (1965), and followed by Vanity of Duluoz (1968). Jack Kerouac, American Writer- a previous blogpost with a list of Kerouac books. It's a quick read, Hilary, and reveals some of his personality. Jack and the Beat writers are an all-American product of their times. I've read On the Road and Dharma Bums. Overall I've found the Beat poets/writers to be pretentious. But being a Deadhead, there is a great deal of crossover because the Beat movement started in San Francisco, and it segued into the hippies. Neal Cassady became good friends with Ken Kesey and drove the first psychedelic bus across the country with Ken & the Merry Pranksters, in 1964. The Dead became the 'house band' at Ken's parties. This is memorialized in one of their earliest songs called The Other One: "The bus came by and I got on that's when it all began. There was Cowboy Neal at the wheel of a bus to never never land." Those were the first two I read in college, JoJo, and I've read some of Ken Kesey's work and the history behind the Merry Pranksters. I didn't know they were the house band, but knew about almost Kesey's retreat . . .I find it neat that you were a Deadhead! don't know how that 'almost' got in there. . . I need to read some Kerouac. And some Cassady. I know both of them have ties to our city in one way or another. In fact, our favorite local Indie book shop has a weekly open mic night for Beat poets/writers to share whatever they're working on, hoping to someday become the future Kerouac or Cassady (having been influenced by them greatly). It's a good time. I agree, you should read them just to get the time period which spawned the Beats and a resurgence of literature in the States. I think that's great that a bookstore there encourages the writers to share their work, a la Greenwich Village and Ferlinghetti's Frisco bookstore, City Lights. We also have poetry readings here in Vancouver at a few spots. Cassady was an interesting fellow, we have one of his books. Sounds like an interesting glimpse into Jack's world and life in Paris. It's one in which Jack is the only character, where many of his other books have the usual cast of Beat characters. Ooh, hope you take care of that tooth soon. Satori in Paris does give you a bit of the real Jack, more so than many of his other books. Like most of us, he wanted to know something about his history. Your new book looks interesting! I've only read On the Road and that was quite the wild ride across North America. I haven't read Satori in Paris but now I'd like to. Anything about Paris, any era, will do. Thanks for taking the time to write such a thoughtful review. This book is more tame, Denise, and it gives us a peek at the man behind the cool exterior. . . I've only read On the Road and enjoyed it. He has an interesting writing style which was different than I had expected--it was much more readable that I thought it might be. For years I had thought that my mother's maiden name was of French origin, but in the past decade or so I discovered that actually it is an old English name with a history that goes way back and there is still an estate in England that bears the name. Exploring one's heritage can make for interesting stories. Kerouac was an interesting guy, and I like most of his writing. He experienced life when America was coming alive again after the wars. Few Canadians have read Kerouac, but he's an American icon as far as I'm concerned. I have read none. I should. I'm sure I watched a documentary/film/something about On the Road, and I was very interested. On the Road epitomized the American driving experience that was born when cars became affordable. It can't hurt to read one book, and Satori in Paris is a short read. Congrats on your recent success! I was here and I'm definitely competing in the 2016 challenge again. Looking forward to visiting you this year. And I'll enjoy reciprocating at your blog. Watch out for those low lying grab bars. . . I've never read any of this author's books but your review makes it sound interesting. I would suggest this one first, if you do decide to give him a try. Glad you enjoyed the review. I like to review books that some may have forgotten about in this new world of ebooks. I have not heard of this author, but the book sounds like a good read.